Gwynnyth Llewellyn is Professor and Dean of the Faculty of Health Sciences, University of Sydney, and Director of the Australian Family and Disability Studies Research Collaboration. Professor Llewellyn's work led to the world's first national strategy to support parents with learning difficulties and promote a healthy start to life for their young children. Rannveig Traustadóttir is Professor and Director of the Centre for Disability Studies in the School of Social Sciences, University of Iceland. She has been one of the leaders in developing Disability Studies as a scholarly field in the Nordic countries and is the former president of The Nordic Network on Disability Research. David McConnell is Professor in the Faculty of Rehabilitation Medicine, University of Alberta. 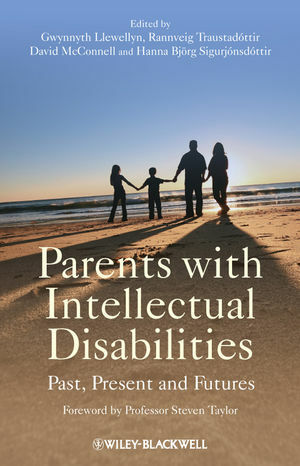 Professor McConnell has been conducting research in the field of parents and parenting with intellectual disabilities in Australia for over 15 years. He is now expanding his research program in Canada. Hanna Björg Sigurjónsdóttir is an Assistant Professor at the University of Iceland. She has conducted collaborative research with parents with intellectual disabilities for 15 years. Together with Rannveig Traustadttir she has published Contested Families: Parents with Intellectual Disabilities and Their Children (1998) and Invisible Families: Mothers with Intellectual Disabilities and Their Children (2001). Introduction (Gwynnyth Llewellyn, Rannveig Traustadottir, David McConnell, and Hanna Björg Sigurjónsdottir). 1. Becoming a Mother – Becoming a Father (Rachel Mayes and Hanna Bjorg Sigurjönsdóttir). 2. Looking Back on Their Own Upbringing (Gwynnyth Llewellyn and David McConnell). 3. Family Within a Family (Hanna Bjorg Sigurjönsdóttir and Rannveig Traustadottir). 4. Children and Their Life Experiences (Jytte Faureholm). 5. Understanding Community in the Lives of Parents with Intellectual Disabilities (Gwynnyth Llewellyn and Marie Gustavsson). 6. Citizenship and Community Participation (Brigit Mirfin-Veitch). 7. Parenting and Resistance: Strategies in Dealing with Services and Professionals (Rannveig Traustadóttir and Hanna Björg Sigurjónsdottir). 8. Parenting Education Programs (Maurice Feldman). 9. Supported Decision Making forWomen with Intellectual Disabilities (Sue McGaw and Sue Candy). 10. Turning Policy Into Practice (Beth Tarleton). 11. Caught in the Child Protection Net (David McConnell and Hanna Björg Sigurjónsdottir). 12. Turning Rights into Realities in Quebec, Canada (Marjorie Aunos, Laura Pacheco, and Katherine Moxness). 13. Supporting Mothers’ Community Participation (David McConnell and Gwynnyth Llewellyn). 14. Advocacy for Change: “The Final Tool in the Toolbox?” (Linda Ward and Beth Tarleton). Conclusion: Taking Stock and Looking to the Future (David McConnell, Gwynnyth Llewellyn, Rannveig Traustadóttir and Hanna Björg Sigurjónsdottir).